Jake, an only boy, lives an idyllic life in the UK. His main passion in life is horse riding and he is looking forward to riding Thunder, his trusted horse, at the next showjumping event. But when Jake's parents adopt a refugee called Faly, he finds that having a new sister is probably more than a cool kid can handle. Faly speaks no English. In fact she doesn't speak at all. Jake is resentful that he now has to share his parents' attention with a newcomer and that the new arrival is eating into his training time for the imminent showjumping event. But gradually Jake and Faly bond and when it seems that the refugee has been kidnapped by two men in a black van, Jake proves to be a real hero and brother. The 'hope' of the title is the name given to a rescued horse that is taken in by the stables where Jake trains. 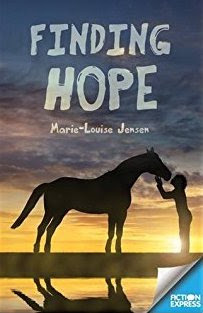 The horse's story mirrors that of Faly, who must start seeing hope in what she considers a desperate situation. Originally written for the Fiction Express platform, this is a fast-paced story that deals with the topic of migrants in a sensitive but entertaining away. Told from the two points of view - Faly and Jakes's - it really lets you in on what the main characters are thinking and feeling. Faly's story includes her nightmare journey across the Sahara desert and the loss of her parents in the Med. Jake's journey towards accepting his new sister is no less interesting. Absorbing stuff! Saviour Pirotta's latest books are the Ancient Greek Mysteries series from Bloomsbury. Pirates of Poseidon is out now. Follow him on twitter @spirotta.